As part of its ongoing work to prevent suicides on the railway, Samaritans, supported by National Rail, has launched a new campaign called ‘Real People, Real Stories’, which sees men who have overcome tough times share their stories to encourage others to seek help by contacting Samaritans. Suicide is the biggest killer of men under 50 and 80 per cent of suicides on the railway are by men. This initiative aims to reduce the risk on and around the railway. By reaching out and interrupting men’s thoughts, it intends to encourage men aged 20-59 to seek help at crisis point, but also at an earlier stage when they are finding life tough. Samaritans know that genuine human connection can make someone stop, breathe and think about their actions. They also know that real people sharing their experience is an extremely powerful and effective way of helping others who are finding life tough. Samaritans believe these authentic stories from real men and sporting celebrities – including former footballer Leon McKenzie and international rugby referee Nigel Owens – will help more people to stop, think and realise that Samaritans is there to listen. The campaign also reflects Samaritans’ updated brand essence of human connection, which is focused on being warm, life-affirming and hopeful, by telling real stories. A survey commissioned by Samaritans in March showed there is still a stigma around men seeking help when they are struggling to cope. In England, Scotland and Wales, 41 per cent of men aged between 20-59 do not seek support when they need to because they prefer to solve their own problems. The survey also showed that men often don’t want to feel like a burden and don’t feel their problems will be understood. This survey found that some of the main reasons why these men find life tough and struggle with their mental health include: debt or financial worries (36 per cent), relationship breakdown or family problems (30 per cent), loneliness or isolation (29 per cent) and job loss or job-related problems (25 per cent). Samaritans began developing ‘Real People, Real Stories’ in 2018. Building on the research cited above, the charity approached men, who had been through tough times, aged between 20-59 to ask them if they would share their stories. 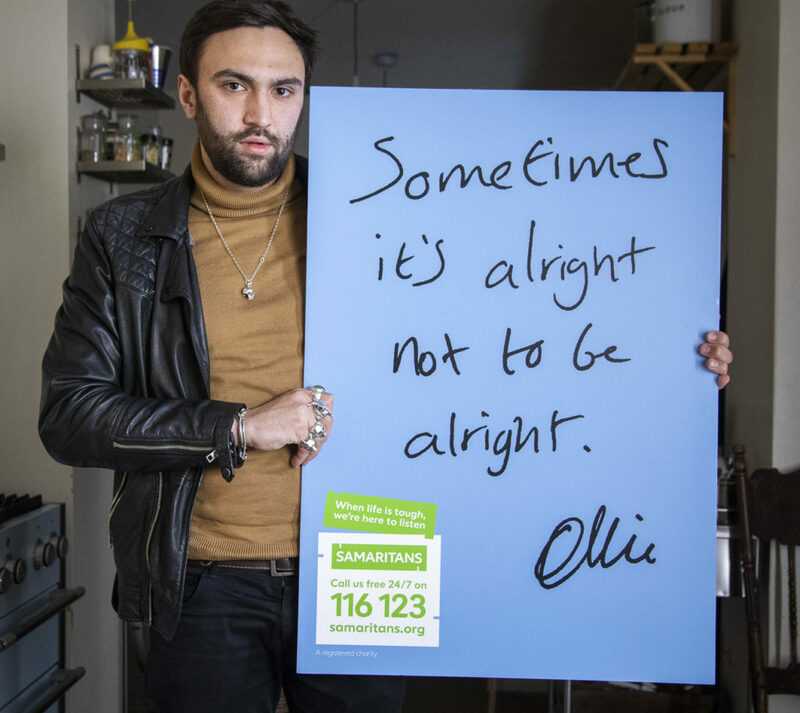 These men – brothers, friends, sons and fathers – were open about their struggles and gave Samaritans handwritten words to sum up their story so that they could be included in the campaign to reach other men who may be going through a tough time. Samaritans has taken these words, and the stories behind them, to create an integrated, multi-channel awareness and behaviour change campaign that draws on this human connection. Samaritans also spoke to bereaved families and rail staff to get their feedback and, as the campaign will be seen by the wider public, the campaign was also tested with parents of children aged six to 16 years old. The feedback was very supportive of the Real People, Real Stories concept. People said that the campaign has “a sense of authenticity” and feels “positive, optimistic and forward-looking”. Using stories from real people, the campaign’s message is that, when life gets tough, tell others and, if you need further help, Samaritans is there to listen. The campaign posters are now on display at sites in and around Great Britain’s rail network. Members of the public will also see this campaign in and outside the rail environment on other printed and digital posters as well as in the media. A key element of this campaign is Samaritans’ new partnership with talkSPORT radio, the world’s biggest sports radio station, to reach more of its intended target audience. From March 19 until May 5, Samaritans’ adverts will run on the radio station and there will also be features as part of the Jim White and Gary Bloom shows. These presenters will be joined by sports stars who will candidly share their experiences of getting through tough times and let others know how they came through it. 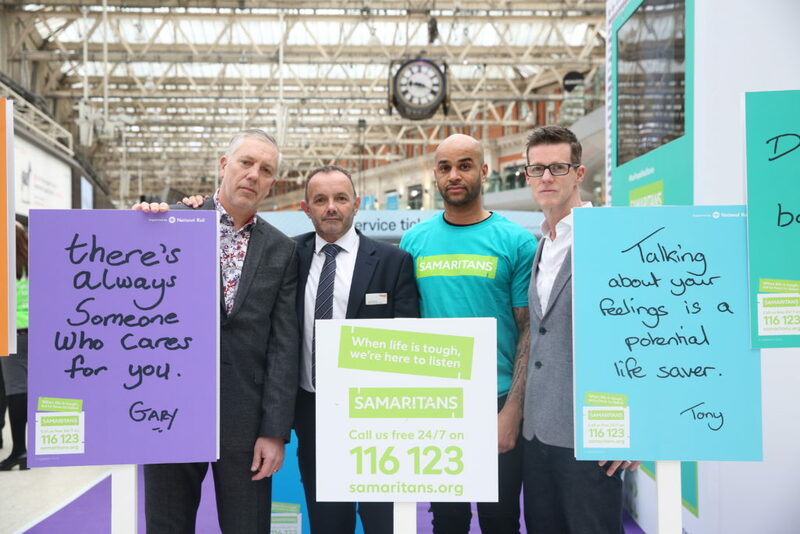 After its successful launch at an event in Waterloo station earlier this year, Samaritans is now calling on rail staff to build up momentum and keep the conversations on mental health going. You can share the campaign video on samaritans.org/realpeoplerealstories with your colleagues, family and friends. You can also support by looking for new opportunities to share the campaign with passengers, such as on digital screens, and by ensuring any existing Samaritans posters from the ‘We listen’ campaign near your place of work are updated. Please email railcompanies@samaritans.org for replacement posters. You can also visit Samaritans’ website samaritans.org/realpeoplerealstories to learn more about the men behind the words and view the campaign video. Finally, you can follow the hashtag #RealPeopleRealStories on Twitter and Instagram to see content relating to the campaign and retweet it to your networks. Samaritans can be contacted by calling 116 123 for free or visiting samaritans.org.